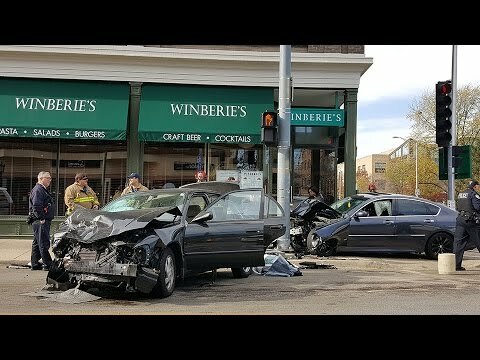 No serious injuries were reported in a two-car collision in Oak Park Monday morning that sent one car onto the sidewalk in front of Winberie's restaurant at the corner of Lake Street and Oak Park Avenue. There were no serious injuries reported in an automobile accident at Oak Park Avenue and Lake Street Monday morning that sent one car onto the sidewalk in front of Winberie's restaurant where it nearly collided with the front door of the establishment. A Berwyn woman driving a black 1998 Toyota Corolla said she was turning west onto Lake Street from Oak Park Avenue and collided with a southbound gray 2008 Infiniti M35x driven by an Oak Park man. Both parties declined to identify themselves. "He's alright thank god," she said of the driver of the Infiniti, who had two passengers in the vehicle at the time of the crash. Oak Park Police Commander LaDon Reynolds said the police were called to the scene at 10:42 a.m., adding that there were a few minor injuries. Reynolds said there was no damage to the restaurant. The Infiniti was sent crashing onto the sidewalk and was brought to rest after colliding with a streetlight pole at the southwest corner of the intersection – just feet from the front door of the restaurant. The driver of the Infiniti said one of the passengers in the car cut her lip in the accident and was transported to the hospital. The driver of the Corolla also injured her knee and was transported from the scene in an ambulance. David Roberts, general manager of Winberie's, 151 N. Oak Park Ave., said employees were just beginning to arrive at the time of the accident. Roberts said he was downstairs at the time of the collision. The two vehicles were towed at around noon, and business at Winberie's was not affected.